Books are constraining by nature, they go through a stage called editing and editors do what they love – “Edit.” It’s vitally important that a “How to” book not be too long and drawn out that the reader can’t get through it. As a new addition to my blog, I’ll put additional information on topics that were cut. If you have the book this will be an opportunity to learn more and if you don’t have the book it’s a taste of what the book is about. The chapter on Software Comparison Page 74, shows the 0EV image and 5 images processed by the various programs: Photomatix Pro, FDRTools, Adobe Photoshop CS3, Dynamic PhotoHDR, Artizen HDR. Here is the 100% crop of each image and a short comment that didn’t make it to print. 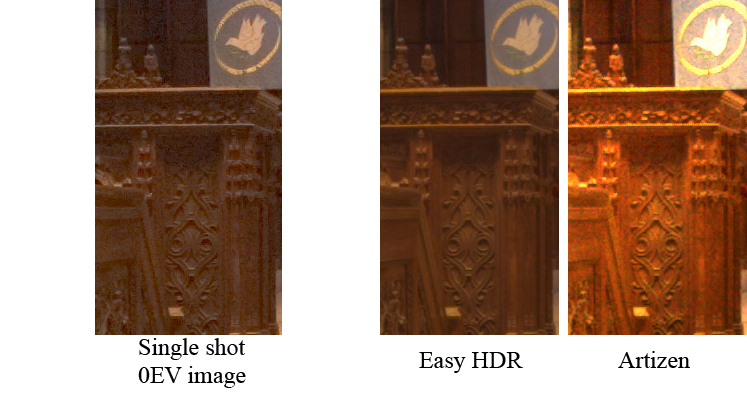 Single 0EV Image – When comparing the single shot 0EV image with the HDR images as a whole, there are two salient points. First, the single 0EV image has greater global contrast and second, it has greater noise. Having greater global contrast is not a bad feature but the noise is bad as it destroys the finer details of the image. Those details are never recoverable. Notice the noise in the darker areas of the image. EASY HDR – the “Mask” Operator (default) has done a good job of rendering the scene and it’s hard to find any area to criticize. The wood design and dove on the flag are well rendered with low noise and good details. With the default settings, the image appears slightly flat but this is only a matter of fine tuning the black and white points in Levels. Artizen – Lock06 (default) suffers from a loss of detail due to noise, most likely being taken from the –2EV exposure. The flag is not well reproduced; the white dove has a loss of detail and is near over saturation ie. blown pixels. Additionally, it appears the 0EV image has more details and less noise. FDRTools – Compressor (default) has done an exceptional job rendering the details of the scene. The image has low noise with excellent local detail enhancements. Local tonal variations (contrast) bring out the texture and 3-D feel of the wood. The white dove is accurately rendered with good detail in the wings. The FDRTools image is better than the single 0EV image in color, noise-free detail and dynamic range. Photomatix – the 100% crop shows that Photomatix handles noise well with no apparent increase over FDRtools or PS. The dove is well rendered with details inside although it has a slight magenta/red cast. The Photomatix image is slightly softer than the 0EV image but it has noise-free detail and displays a higher dynamic range. Dynamic Photo HDR – I used the “Eye Catching” tone mapping operator and as you can see the 100% crop shows good detail and local contrast. There is color shift similar to Photomatix. Great info for folks like me that wonder about ways to improve the quality of thier work but just never seem to have the time to try everything! Somehow i missed the point. Probably lost in translation Anyway … nice blog to visit. © 2019 Before The Coffee|ProPhoto Photographer Blogsite by NetRivet, Inc.